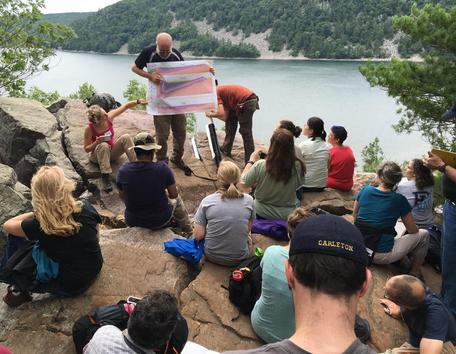 Help NAGT improve teaching and learning about the Earth with your donation today. Every day, NAGT supports a diverse, inclusive, and thriving community of educators and education researchers through innovative teaching resources, community networking, professional development opportunities, and more. Your gift will help NAGT continue to celebrate and amplify the vital role of Earth education in today's world. NAGT members represent all 50 states in the United States as well as other nations. The programming and resources developed and sponsored by NAGT reach over one million people every year. With your gift today, more educators will gain access to resources that will support their teaching, help increase their connections across communities and departments, and improve their students' Earth literacy. 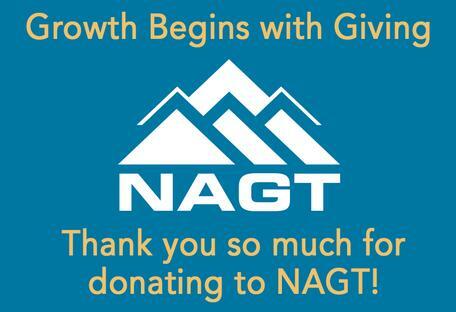 As a member-supported, non-profit organization, NAGT values and benefits greatly from your donation. NAGT is a 501(c)(3) tax-exempt non-profit organization. All contributions are 100% tax-deductible. Members! Thank you for making the decision to donate to NAGT. Donating through your account is quick and easy. Your NAGT membership has lapsed! Please consider renewing your membership - you will have the opportunity to donate as part of the renewal process. Members! Thank you for making the decision to donate to NAGT. Donating through your account will make the process quick and easy. If you are not yet a member of NAGT you can join now and make your donation as part of the joining process. Or, if you do not wish to join NAGT, please continue and use the donation form below. Donations to the NAGT Program Fund are used to support NAGT programs and operations in the budget year in which the donations are received. Making a donation to the NAGT Program Fund allows us the greatest flexibility to put your dollars to work. Donations to this fund are used to support professional development activities, including websites for educators, in the budget year in which the donations are received. The Leland Horberg Memorial Fund was established by friends of Professor Horberg, longtime professor of geology at Augustana College, at the time of his death in August 1955. Donations to the fund support Association programs designed to improve the teaching of the Earth sciences. Since 1990, donations to the fund have also helped support the Association's Field Camp Scholarship program. The Rosalsky Fund was established in 1970 as a tribute to Maurice B. Rosalsky for his many years of dedication and service to the Association, including sixteen years as National Secretary and Secretary-Treasurer of the Eastern Section. Donations to the fund help support a variety of Association programs. Since 1994, with the concurrence of the Rosalsky family, donations have been used to help support Field Camp Scholarships. All donations made to NAGT's Professional Development Fund from July 1-August 1, 2018 will go towards Earth Educators' Rendezvous 2019 travel stipends. NAGT has established a number of other funds that are used to support specific activities during the current budget year. They include the NAGT Program Fund, Field Course Annual Scholarship Fund, Professional Development Fund, Dorothy Lalonde Stout Fund, and Minority Support Fund. Please print, complete, and include this form (Acrobat (PDF) 86kB Nov20 17) with your mailing; checks should be made payable to NAGT. A receipt for your donation will be sent via regular mail to your address. Absolutely. The security and confidentiality of your information is our highest priority. We use industry-standard secure technology to protect your information and provide a safe environment for online donations. We will not sell, trade or share your personal information with anyone else, nor send donor mailings on behalf of other organizations, and we will only share personal information if you have given us specific permission to do so. NAGT is a publicly supported organization as described in section 501(c)(3) of the Internal Revenue Code and our Taxpayer Identification Number (TIN) is 74-6068050. To claim a donation as a deduction on your U.S. taxes, please keep your this donation receipt as your official record.